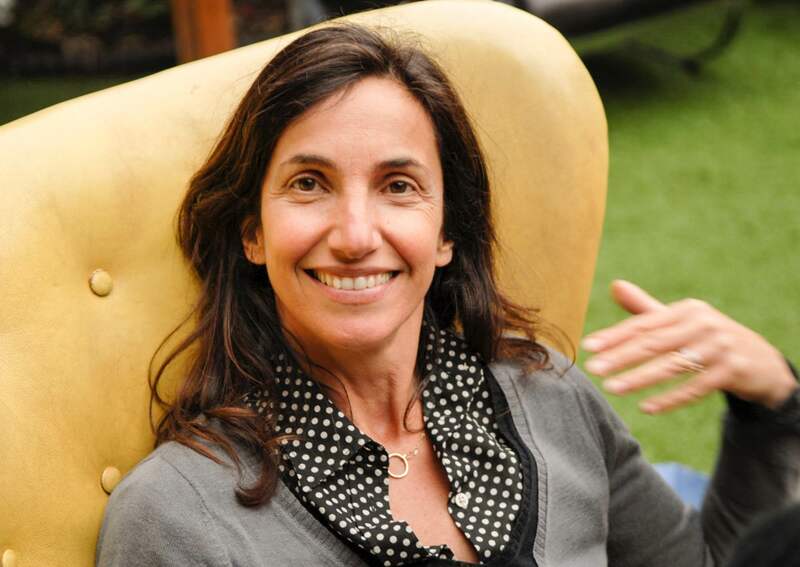 Above: Gaby Dellal, director of 3 Generations. Photograph courtesy of Gaby Dellal. 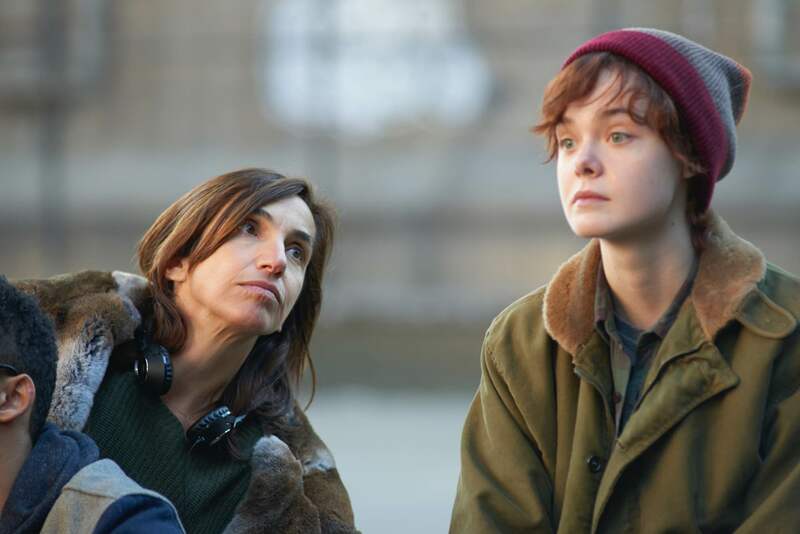 New York-based film director Gaby Dellal tells all her stories straight from the heart. With humour and grace, her latest film 3 Generations guides its audience to explore the human condition by presenting them with a life-altering decision — one from which there is no going back. Ray (Elle Fanning) is a sixteen-year old trans youth who wants to begin hormone therapy in order to medically transition into becoming a boy. Helping him navigate this life decision are his single mother Maggie (Naomi Watts), his grandmother Dolly (Susan Sarandon) and his grandmother’s partner (Linda Edmond). “At its core, this film is about the everydayness of being a family and finding a way through the challenges that come our way,” Gaby says. People frequently ask Gaby, a mother of three boys, if she has a son who is transitioning. 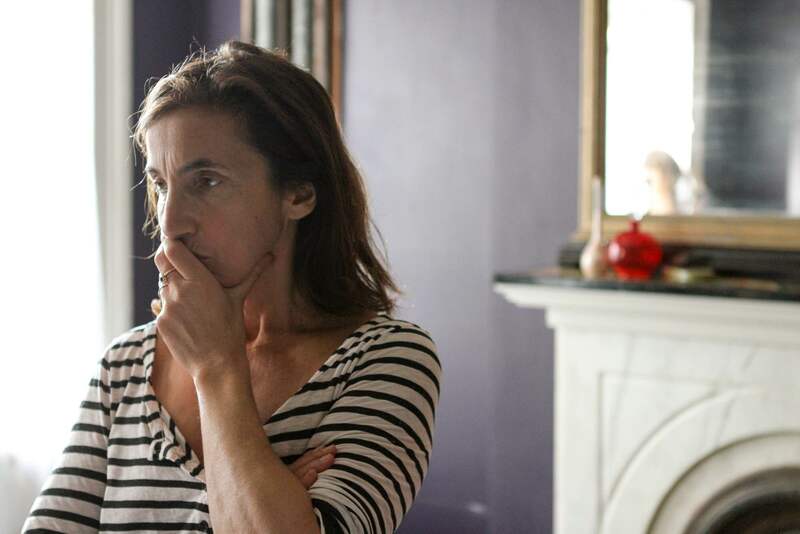 “I don’t,” she says “but my relationship with my sons and everything I have been through with them is the inspiration for the film.” On the eve of the opening of 3 Generations, Gaby explains why she tells this story. N.B. : 3 Generations opens this Friday, May 5, in New York City and Los Angeles, and nationwide in the US on Mother’s Day, May 14. 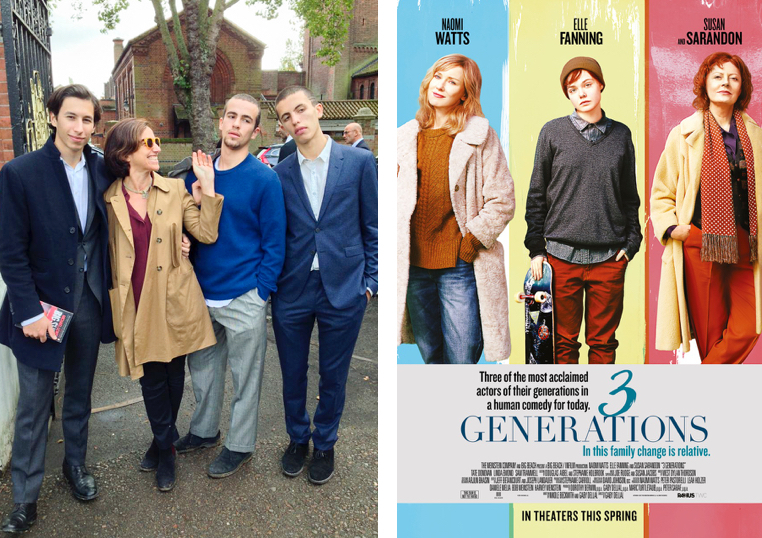 Above: Originally from London, Gaby moved to New York to film 3 Generations. Where ever she sets up home, it quickly becomes a youth hangout. In this gag photo (a present for a friend), Gaby poses with two of her sons (on either side of her) and a family friend. Photograph courtesy of Gaby Dellal. Fabulous Fabsters: How did the making of 3 Generations come about? Gaby Dellal: This film came about from my experiences of being a mother and learning to accept the importance of listening to my children. Initially, I was looking at some of the challenges my family and I had faced — ones that I had never imagined we could deal with and yet we did. And then I happened to meet someone whose daughter had just told him that she wanted to become his son. Up until then I had not met a trans youth and more importantly I hadn’t met any trans youth parents. This father was “macho” and accepting, which blew away all my preconceptions. And that’s when I realised that that there comes a point when we stop teaching our kids and they are the ones who guide us into the current cultural milieu. We can’t be stuck in our old ways of thinking how they should live. That’s what inspired me to write this story. 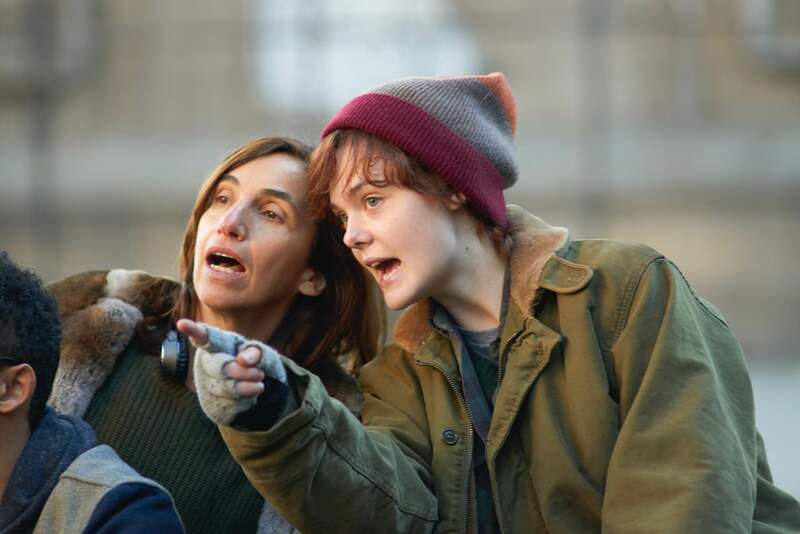 Above: Gaby and Elle Fanning on the set of 3 Generations. FF: So you didn’t start out doing a film about transgender issues? GD: I didn’t start with the intention of making an “issue” film, but at the same time I want to honour the subject that I used to tell the story. In fact that’s the beauty of telling stories. You have to immerse yourself in whatever subject you choose and in so doing, you learn so much. FF: What did you learn? GD: I have a tremendous amount of respect for the kids and the parents in the transgender community. The kids we met and interviewed for this film have been dealing with this dilemma that they have carried with them since they entered the world —as a result, they are highly evolved individuals. And at first, they had to navigate these uncertain waters by themselves — feeling and being made to feel different, being bullied and having their lives threatened. And it’s extraordinary what they do to come through it. And the parents have their own journey which is also remarkable. They have to understand and accept what their children are undergoing and then they have to find a way to support their child. 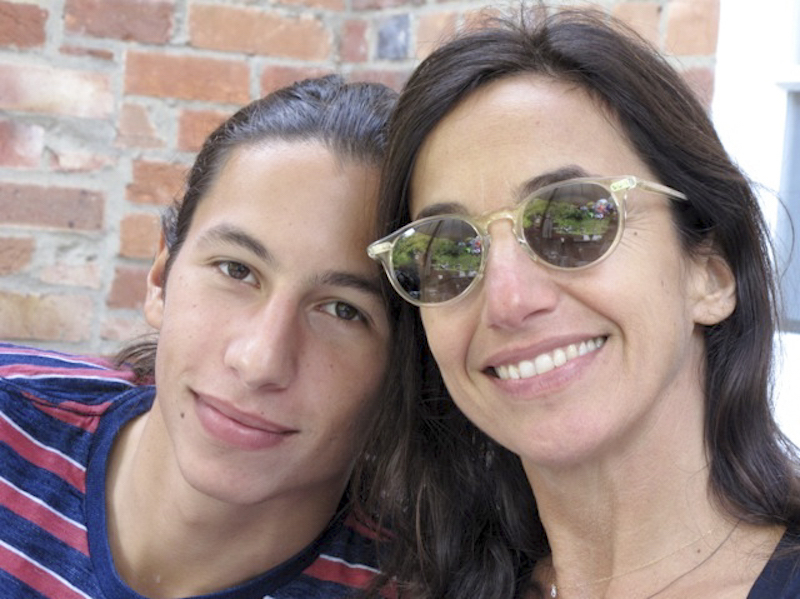 Above: Gaby with her eldest son Jake. Photography courtesy of Gaby Dellal. FF: What interests you the most about the challenges these families face? GD: On one level, you can’t compare the challenges these families are meeting to the ones the rest of us have, and yet at the same time you can. We all have to face up to with what we get dealt and how that sits within our own family dynamic. I have written a part of my own life into the film. The divorced, single mother whose children are doing their best to bring a modern family together is my story too. And instead of making it easy, the mother resists because she’s too frightened of moving forward. The crux of the film is about breaking the fear and the anticipation of the unknown in order to move forward. Above L: Gaby and her three sons. Above R: 3 Generations opens this Friday, May 5, in New York City and Los Angeles, and nationwide in the US on Mother’s Day, May 14. FF: Tell us about the recent R-rating controversy? GD: I started making this film with no idea of where it would take me and when the ratings controversy materialised, I realised how large my responsibilities had become. And because the film has always come from a very loving place, I have always wanted to make it as accessible as possible. The controversy surrounding the R-rating is well earned. We set out to raise the awareness of transgender issues in our culture and get people to understand these issues. If we can get a lot of people into the cinema, we are doing a great job. Thankfully because of advocates like Blair, the MPAA (Motion Picture Association of America) has changed their initial R-rating to PG-13. We’re all thrilled about this. 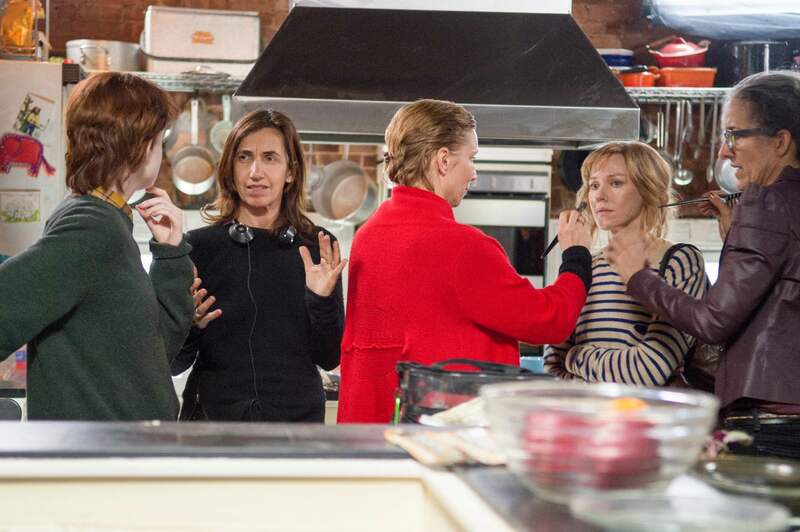 Above: Gaby on the set of 3 Generations with Elle Fanning and Naomi Watts. Photography courtesy of Gaby Dellal. FF: What is your greatest hope for this film? GD: That people gain an understanding that in relating to each other, we’re all normal, we’re all human and we can all get it wrong. Relating to each other successfully is a process. Above: A mother and son cuddle. GD: My staples are Birkenstocks in the summer and Clark’s suede desert boots in the winter. And then it’s jeans and stripy t-shirts — simple and comfortable. FF: What’s in your Prescient Pantry? GD: Perfectly ripe mangos and avacados, an amazing bottle of red wine and olive oil and a very soft loaf sourdough bread from Lafayette Bakery in NY. FF: How do you stay strong in your mind and body? GD: I’m a yogi. I have been practicing yoga since I was 19 when I first started with Bikram himself. I believe strongly in my yoga and it really does help me. Also, I have two large dogs and I walk them every morning in Central Park for at least 1 ½ hours a day. I always get something out of that walk. FF: Any messages to your younger self? GD: It’s all right to be yourself, which is the message of the film as well. I was always told that I was too loud or naughty but it’s all right to just be you. Above: The film director takes a break. Photograph courtesy of Gaby Dellal. A Fabulous Fabster thank you to Gaby Dellal! Thanks Atalanta. Gaby has made a great film — looking forward to seeing more of her work in future. All the best, Christine. Great interview FF! Thank you. Like the photos, too.